I love mimosas, let’s be clear about that. Champagne and OJ is one of those great combinations that was just meant to be. However, I find myself getting bored from time to time and straying from the classic go-to. At a recent brunch, I decided to give my guests options and served them two ‘mosas that were new to them: Beermosas and cucumber honey mimosas. Being the hop-fiend that I am, I went for the IPAmosa and loved it. The color was a pretty pinkish red and the taste was fantastic. I wish I could remember the details of the taste to describe, but all I can remember right now is that it was good and I had more than one. 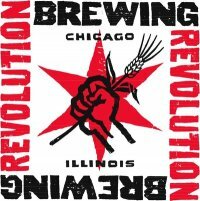 I am heading back to Chicago in July for the music festival again and will have to re-visit Revolution Brewing Company to refresh my memory (for inquiring minds that care, the above mentioned music festival is Pitchfork Music Festival – a favorite annual summer time trip for me). Throw the raspberries, OJ and agave in a blender and pour in water until it reaches the consistency you are looking for. I like it to be thick, but pourable. If you want it sweater, you can add more agave or OJ and less water. Assemble this fine drink by pouring equal parts Alligash White and OJ into a glass, then top it off with a few spoon fulls of the puree (Proceed with caution! The puree tends to create some fizzing action). Enjoy! 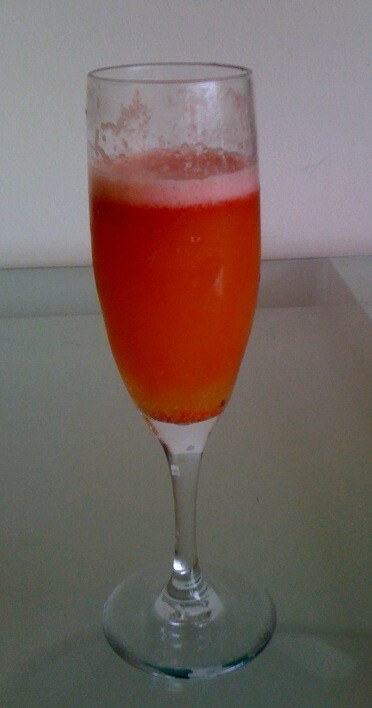 The second ‘mosa style that I served was champagne paired with a cucumber honey juice. I discovered this lovely and refreshing mimosa on a trip to San Diego I took to steward at the 1st round of the American Homebrews Association homebrew competition. 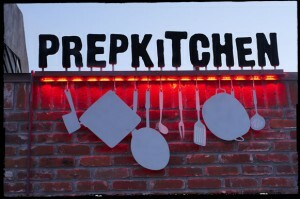 To reward myself for a job well done, I went out to brunch the next day at a place called Prep Kitchen in La Jolla. The place was tiny, but was just my style. We sat outside on the front porch and settled in for a great brunch. The menu was small, but everything sounded great and it was. They use fresh, local ingredients and it showed in the taste of the food. Peel the cucumbers (saving the peel) and grate them. I used my food processer to make quick work of this. Add the water and honey to a large sauce pan and bring it to a boil, making sure to mix in and dissolve the honey. Once the honey is dissolved, add the grated cucumber juice to the pan and simmer for 10 minutes. Remove the pan from the heat and let it cool for at least 20 minutes before attempting the next step unless you want hot cucumber juice all over your clothes and kitchen cabinets. Trust me on this one, I know from experience. Once the liquid is cool, add it to a blender with the peel and blend away. I did this in about 3 batches. Blend until the mixture is smooth. Strain the liquid into a pitcher. I did this using a fine mesh strainer I have. You can also use cheese cloth, a kitchen towel, etc. At this point you have made the juice. Poor a healthy amount of champagne into a glass, fill the rest of the way with cucumber honey juice. Repeat until the juice is gone, or until you have started freely telling embarrassing stories about yourself (or others) to your friends that you never intended to let out. This drink was a big hit with my crew at brunch. At first they were a bit skeptical of the green juice, but slowly, one by one, they tried it and soon it was all gone with people requesting more. Success! I did observe someone do something with the juice I would NOT recommend. They mix the cucumber juice, OJ, and pineapple flavored wine. There are so many, many things wrong with that. Thanks so much for the cucumber honey mimosa recipe! I happen to be lucky enough to live few miles from said Prep Kitchen, and been going there for years for the delicious brunch, but also for these amazing and refreshing mimosas. That said, I am about to attempt these in my new cute 7-liter drink dispenser to serve at a pool party. I am thinking of using vodka as the main alcohol, but adding some champagne as well. Do you have any words of wisdom for my large batch punch-style attempt? Hi Satusha. That sounds pretty good and like a good party in the making! To be honest with you, I don’t work a lot with hard liquor, but if I was going to add vodka to the mix I would probably do 1 bottle of champagne to 3/4 cup vodka. If you want it stronger you could go up to 1 – 1.5 cups vodka. I would add in 1.5 cups of the honey cucumber juice to start and see how it taste. Add more as needed to get the right flavor. Some cut up strawberries and/mint added to the dispenser could be fun too and add nice color. Enjoy and have fun!